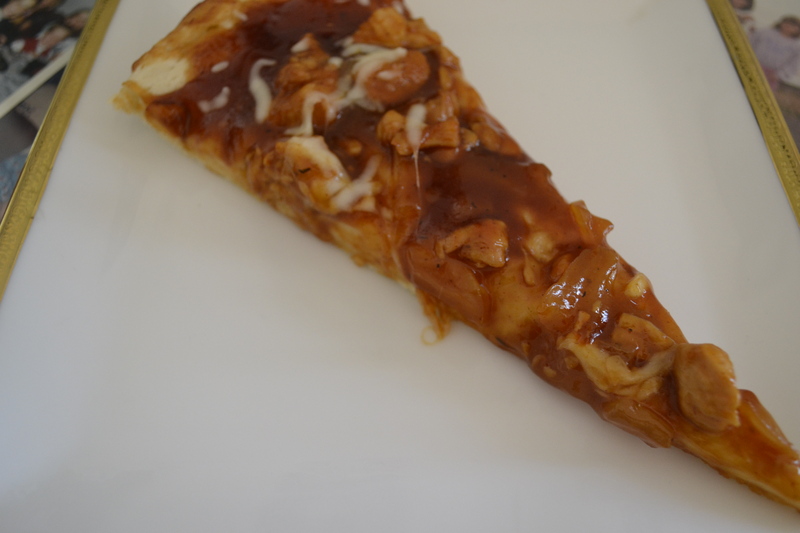 The first time I tried BBQ Chicken Pizza was at a pizza place in Riyadh. I loved it and set to making my own signature pizza. I have made it ever since and my kids just love it. I hope you will too! I cut the recipe way down and put approximate measurements. Like many cooks I usually don’t measure but go by the look of the dough etc. So this is an estimate! Dissolve yeast in warm water. Put flour, salt and oil in mixer. Add yeast and water to flour and mix. Use a dough hook and knead or use your hands. Knead for a few minutes, shape into a ball, cover and let rise to double in size. Add a little more flour a spoon at a time only if needed to make dough easier to work with. Chop onions and place in large frying pan and saute in olive oil, add chicken and let cook, add 1 cup of BBQ sauce (reserve 1/2 cup to put on pizza crust) and water, bring to a boil, turn heat down, cover and simmer. Let the chicken cook until done and simmer so it soaks up the flavor. These are approximate measurements. When dough has risen, punch down. Shape into a ball. Prepare pan using cooking spray or use a non stick pan. 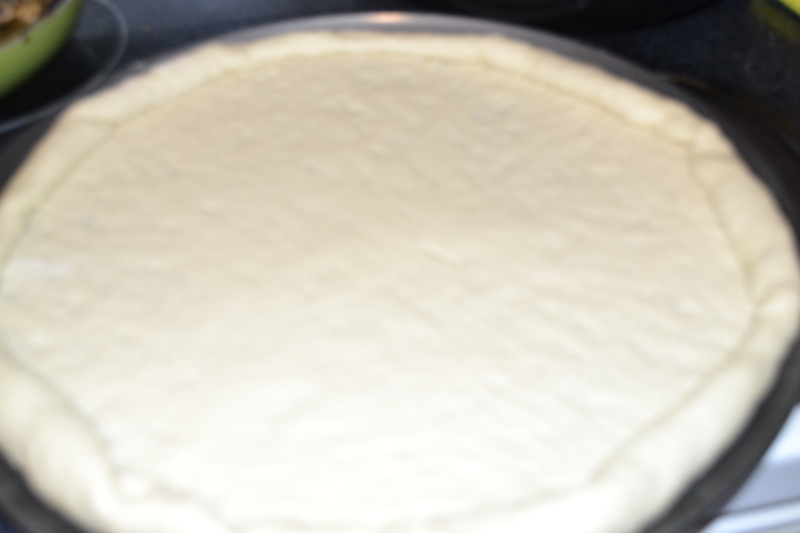 I use the pans with holes in the bottom, they give a crunchier crust. Roll dough out and shape into circle, lay in pan. 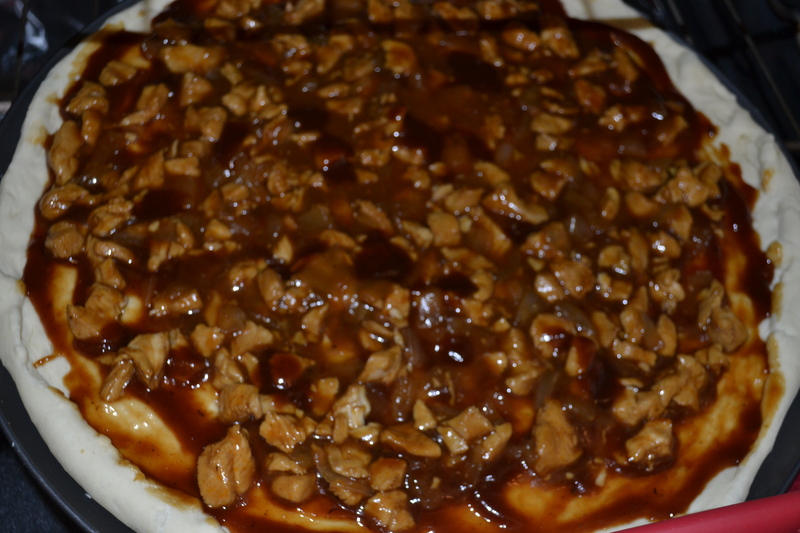 Top with BBQ sauce left over from bottle, spread evenly over crust as you would if you were using pizza sauce.Using a slotted spoon scoop up onions and chicken and some sauce and place around over crust. Place on bottom rack of oven for 12-15 minutes. Take out of oven, sprinkle cheese on pizza lightly. Move to top rack and cook another 10 minutes or until done. Remove and cut. Watch pizza carefully so that it doesn’t burn. Make sure it has had enough time on bottom rack before moving it to top rack so that crust is crunchy.